The Elephants Tour England is now available as a downloadable e-book from Amazon Kindle. When you're a family of the world's largest land mammals, life isn't easy. "The Elephants Tour England" is a book aimed at first and second graders just beginning to read things slightly more difficult than picturebooks. 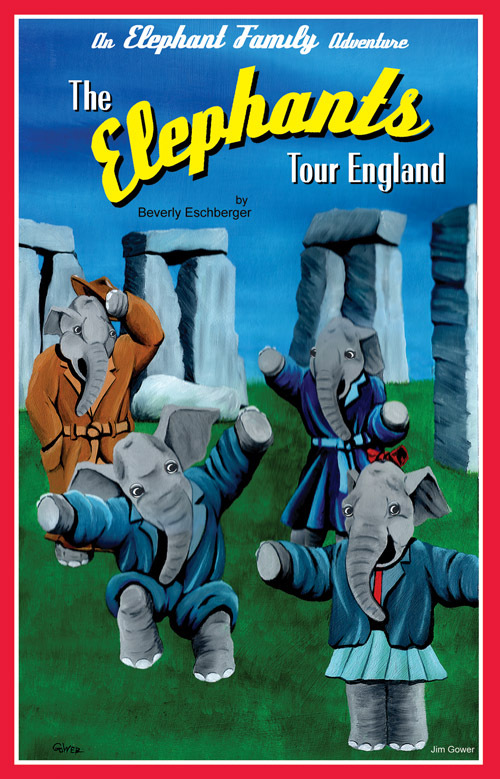 Following a family of elephants as the tour England, it tells a story young readers will relish as they learn about the wonders of England and perhaps something of its neighbors. "The Elephants Tour England" is a fine choice for those catering to very young but adept readers. A delightful and imaginative series of books is centered around "the Elephant Family Adventures" written by Beverly Eschberger and illustrated by Jim Gower. The books are published by Artemesia Publishing, LLC 9 Mockingbird Hill Rd, Tijeras, New Mexico 87059. Phone number is (505)286-0892. Website is www.apbooks.net. Latest title in the series is "The Elephants Tour England." Father Elephant is the ambassador to England from a small African country called Elephas. Mother Elephant is a mom, artist and the ambassador's wife. They have twins, a boy and a girl, named Harold and Penelope. Of course, the family has to travel in disguise so humans will not be aware there are elephants among them. Their disguise name is Elefant which hearers seem to think is French. In this book, the Elefants tour southern England visiting famous landmarks like Stonehenge, the city of Bath and many more interesting places. When the twins get separated from their parents, it gives them an opportunity to learn the French language from some traveling French students. Mother and father Elefant's search for their missing children allows lots of other locations in southern England to be introduced and explored. This book is a great learning tool about England. There are several lists of words to explain different terms used in England. There is an explanation page regarding foods eaten and a list of definitions for French terms introduced and used. This book is an imaginative tour which can be enjoyed by juvenile readers, classroom reading circles and family reading circles. Winner in the 2009 New Mexico Book Awards Young Readers Book (to grade 3) category.